Underrated in Australia, Celeriac is a root vegetable related to celery and easy growing in similar conditions, however it is a very different vegetable altogether. If you would like to grow it in the home garden seedlings and seeds are readily available for sale from online suppliers. Grown for the swollen root rather than the green stems, this is a great addition to a number of dishes and recipes. 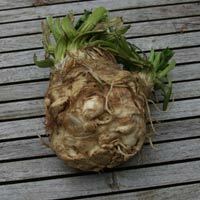 It is the flavour of the celeriac root that is the attraction. It has a nutty flavour, a little spicy, and little taste of celery. And this makes the best mash you can imagine, either by itself, or with other vegetables. Cooked it makes a great addition to a number of dishes and recipes including the famous, Celeriac Remoulade. It can also be roasted, used in mash, soups or stews. Raw it can be used to make a very interesting coleslaw, or it can be used in a a salad with a little olive oil or your favourite dressing. And for using Celariac raw, you need good fresh bulbs and these are best home grown. So choose a variety and start planting. Bianco del Veneto has smaller bulbs and much less edible flesh than say, Prinz, however some say that it has a finer texture however we think it is a waste of time and would grow Prinze in preference. Giant Prauge is another good variety as are Monarch and Rowena. Monarch has large bulbs and a smoothish skin, easier to peel. You can grow this wonderful vegetable from seed or from seedlings. The disadvantage of growing from seeds is that this is a slow grower, seeds seem to germinate in a week or two, but then ‘sits around’ for a while. The ideal time to plant celeriac into the garden is in spring. We suggest sowing seeds indoors or in a cold frame in late winter to give them a good start and then transplant to the vegetable garden as things warm up a little. Celeriac can be grown from seeds, usually started indoors or in a cold frame. We suggest planting in individual paper pots, or ‘biodegradable’ pots, sometimes called ‘jiffy pots’, let the seedlings establish and then plant out in late spring to early summer. Although seedlings are sometimes available at nurseries and are easier and quicker, seeds are also widely used and can be collected if you let a plant go to seed..
Seedlings can be planted out in November in cooler areas and will take 2-3 months before they are ready to harvest. In sub tropical areas a second planting in May will produce good results. Best time to plant seeds and seedlings is in spring as the weather warms up. Harvest time will be around 6 months later. Best fertiliser is a low nitrogen one as you are looking for root production, not foliage growth. We hear that many home gardeners find that celeriac does not form a bulb. If you plant celeriac into cold ground it can decide that it is the second season of its life cycle (its a biennial) and instead of growing the root, it goes straight to setting seed. Other gardeners plant the seedling to deeply, the crown must remain just above ground level, which leads to the next issue of water, planted with crown so high, drying out is a problem. Lack of water is a problem once planted out,this is a vegetable that does not like dry conditions. Frosts are a problem, this is not a frost hardy plant. Most information on growing celeriac mentions full sun, however much of this is from the UK and not really relevant to Australian conditions. In our hot summers, a little afternoon shade can be desirable to prevent drying out. Sandy soils are also a problem, a rich loamy soil is ideal.